The blurb: It’s the late 1970s, and Christopher Fowler is a film freak, obsessively watching lousy films in run-down fleapit cinemas. Longing to put his dreams on the screen and become a famous screenwriter, he heads for Wardour Street, the nation’s equivalent of Hollywood, with an armful of scripts. But he’s made a spectacular mistake. He arrives just as the industry falls to its knees, knocked down by the first appearance of video and the destruction of the old movie palaces. The only films being made are smutty low budget farces and TV spinoffs. He thought he’d be asked to make another ‘Bullitt’, but finds himself writing short films for boilers. Somehow, against the odds, he finds success – although in a very different form from the one he expected. 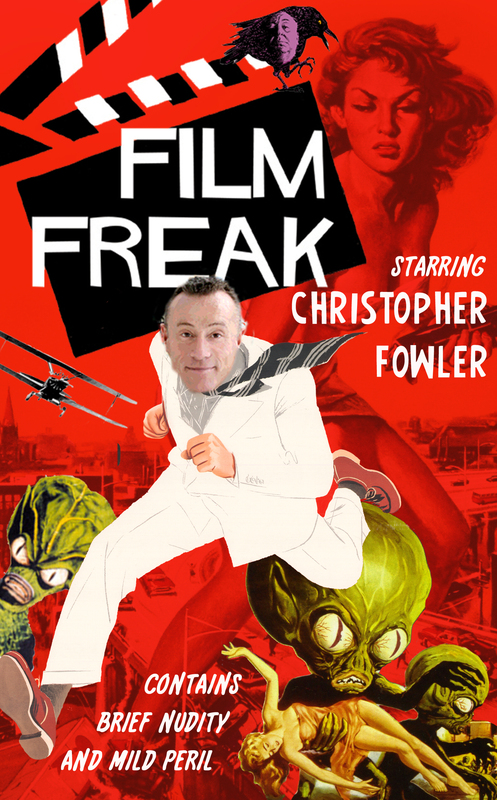 Ghastly, hilarious and finally moving, Film Freak is a trawl through the arse-end of the British film industry that turns into a search for friendship and happiness. My review: I was sceptical, I’ve read Fowler’s Bryant and May Peculiar Crimes Unit books but none of his non-fiction and I didn’t really appreciate what an extraordinary life one man could’ve had. On the face of it, when you take the composite parts of Fowler’s life they sound staggering. The kind of life details, that could only belong to some jet-setting, famous, all swagger marketeer. But this is not the case, here is a man of gentleness, with the same foibles and insecurities as the rest of us. I don’t think I know a single person who hasn’t tried or thought about their dream job to find it’s impossible to get into or not quite as perfect as the dream. My film knowledge is not up to snuff. But I dont think that stopped me from thoroughly enjoying this book. The main word I would use to describe this book is ‘bittersweet’. It’s full of nostalgia and one man’s struggle to find his place in an industry that’s changed beyond all recognition. The collection of people that populate this novel is at once endearing and intriguing, Fowler paints them as he remembers them and they are almost universally larger than life. His best friend, confidante and business partner Jim is a character that I immediately fell in love with and wished I could’ve met. It’s witty, funny, heart-warming and sad, Film Freak moved me in a way no book has done for quite some time. I’m putting that down to the realness of it – Fowler is a remarkable social observer. As an add on the footnotes in this book are hilarious. Read it just for them if nothing else! This comes highly recommended from me. I do not know if it’s just me or if everybody else encountering issues with your site. It seems like some of the text on your posts are running off the screen. Can somebody else please provide feedback and let me know if this is happening to them too? This may be a problem with my web browser because I’ve had this happen previously. How odd – I didnt notice. Will go and check again!